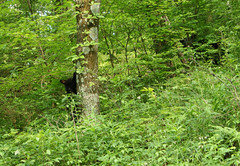 Last week, I shared a photo of a bear I took recently in Shenandoah National Park. Turns out it was a mama bear as we then noticed three cubs hanging on trees and then following behind. Here is one of them (they were spread out so I did not get them in the same photo) and you can see the mama bear in the foliage.